Last Spring I attended the SNAP conference. I met so many amazingly wonderful ladies there and made lifelong friends. Today I'm teaming up with a few of those ladies to bring to you and AMAZING crafty giveaway. I have an awesome prize up for grabs. There are goodies from American Crafts, Bella Blvd, Pink Paislee, Elle's Studio, and Heidi Swapp. To enter to win this prize leave a comment on this post. Please leave your email address too (in code if you prefer) your email address will only be used to contact you if you win. This giveaway ends at 12:00am on September 11th, 2014. I'll announce the winner on Friday, September 12th 2014. Good luck! I'm so excited about all of these wonderful giveaways!! I love to make cards and scrapbook. Thanks for the lovely giveaway! Wow! Thats so nice to have a chance to win all this! Thanks! Thanks for the chance at this great giveaway, Becki! I love your blog and your work! These are some awesome things for a giveaway. I am happy I found your blog! Thanks for the generous giveaway! The chalkboard banner and glitter tape look like fun! Awesome goodies and I loved your embossibilities scrapinar - you are amazingly talented!! Thanks so much for the chance to win some of your goodies!!! Awesome is an understatement! That is a seriously fabulous, completely amazing and genuinely generous prize! I love a good blog hop, thanks for the fun. Wow! What an amazing giveaway :). Thanks for the chance! Awesome prize fo sho! Thanks for the chance to win it. Sounds like it was an awesome conference! Thanks for a chance to win a great prize! I love the blue typewriter letters and the washi tape, or is that ribbon? Doesn't matter, I would love either one. What a gorgeous pile of goodies (pile? sorry that's not a pretty word) I would put that pile to GREAT use! pajamapants79 at gmail dot com Jill T.
Oh my gosh, what a giveaway! Thank you for the chance to win! Loved your blog post about making your own scrapping embellishments because that's one of my favorite things to do! Loving the blog giveaways. Thanks! Thanks so much for this fun giveaway!!! Oh what a huge fun giveaway!! Thank you for your generosity! I would love to add these to my craft stash. How sweet of all of you to do this! great prize! you should be able to get my email address from my profile as I'm a reply blogger. What a great giveaway! I love all of the ribbon :D.
Thank you for the opportunity to win some of your FAVE things!!! You're AWESOME!!!! Thanks for a great giveaway! Love all that tape! 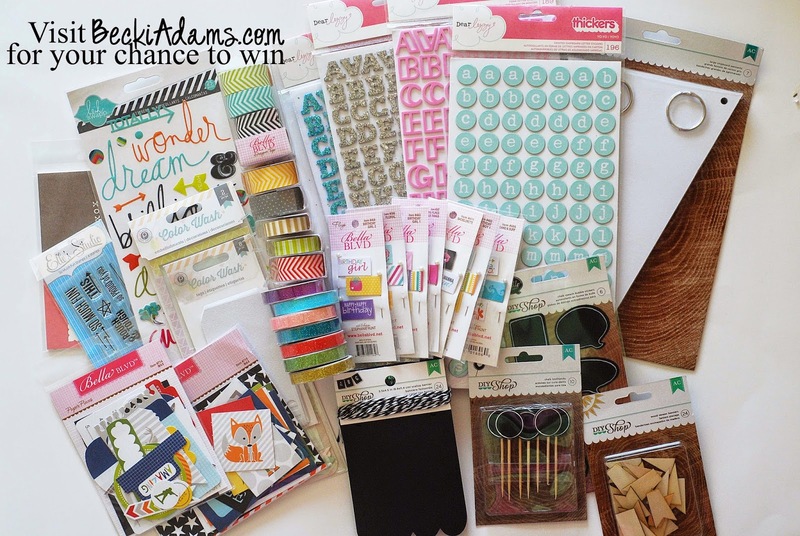 Oh wow what a wonderful giveaway, so many great craft items, thanks for the chance to win. Fab give away! Thank you for the opportunity! So many great products in that group. Thanks for the chance to win! So many cute products in your giveaway. I'm in love with that little fox in the Bella Blvd die cuts package. Also loving all the Thickers. Thanks so much for the chance to win! What a beautiful assorted! Would love to win! Thanks so much for the chance! Such a great giveaway! Thank you for this wonderful giveaway!! Just looking at all the goodies makes me dizzy!! That's an awesome prize Becky, thanks for the chance to win. What an awesome giveaway! I wish I could go to Snap conference someday. Thanks! A fantastic giveaway. this looks like so much fun. Wow--nice package--thanks for the opportunity! Wonderful! Thanks for sharing the goodies! rgauss at sbcglobal dot net. what fantastic items! I need to craft more. Oh what an awesome giveaway :))) Enter me please! Wow! Thank you for the chance to win such an amazing prize! Such a great giveaway! Thank you for the chance! Wow, love this giveaway thanks for the chance.